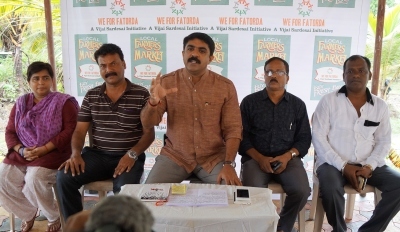 As he turns 46 tomorrow, Fatorda’s independent MLA Vijai Sardesai is launching local farmers’ market to Wi Fi by inviting BJP’s senior minister Dayanand Mandrekar. The Fatorda MLA has claimed that he has fulfilled most of his poll promises made in the manifesto, except four - Fatorda Lake Project, Bus Terminus, Fatorda Police Station and Heritage Conservation Scheme. “Fulfilling these promises is possible only when you become a minister”, said Sardesai, who has also initiated a regional outfit – Goa Forward. In fact Goa Forward chief spokesperson Prashant Naik was sitting next to him at the press conference. The highlight of series of his birthday programmes tomorrow however would be the market for the locals farmers he is opening. Sardesai, a graduate in agriculture, said he would welcome if this model is replicated by others and especially by the Goa Horticulture Corporation all over Goa. He plans to subsidise the farming operations and distribute fertilisers to these farmers tomorrow. Besides this, he is also inaugurating a public ground, 30 solid waste transfer stations, initiate the construction of a long pending nullah at Borda and hold blood donation programme. He also said the Wi Fi initiative inaugurated last year will recommence tomorrow. He was also accompanied at the press conference by his wife Usha and councillor Angelis Pereira. And this loud mouth is wet dreaming to become Chief Minster. And wonder how? Forever independent, Goan Forward, MLA..